100 Heirloom Tomatoes for the American Garden; Carolyn J. Male, Workman Publishing Company, 1999. Heirloom Vegetable Gardening; William Woys Weaver, Henry Holt & Company, 1997. Melons for the Passionate Grower; Amy Goldman, Artisan, 2002. The Compleat Squash; Amy Goldman, Workman Publishing Company, 2004. The Great Garlic Book; Chester Aaron, Ten Speed Press, 1997. Heirloom Vegetables; Sue Stickland, Simon & Schuster, 1998. The Heirloom Gardener; Carolyn Jabs, Random House, 1984. Seed to Seed (Second Edition); Suzanne Ashworth and Kent Whealy, Seed Savers Exchange, 2002. According to Kent Whealy, founder of Seed Savers Exchange, the country’s largest preserver of heirloom seeds, 90 percent of the seeds available in 1900 no longer exist today. Whealy says that several forces threaten this irreplaceable genetic diversity, including takeovers and consolidations within the mail-order garden seed industry, the profit-motivated hybrid bias of most seed companies, and plant breeding for mechanical harvest and cross-country shipping. Whealy and his organization are doing their best to save these old varieties with a membership of 7,000 people and a collection of 25,000 vegetable varieties at their Decorah, Iowa, Heritage Farm. “Gardeners should be extremely pleased to learn that 2,657 unique, new varieties have been introduced within the past six years,” says Whealy. Heirlooms are always open-pollinated. That means, unlike hybrids, they will duplicate the parent plants in the next generation. “Typically heirlooms are of species that are easy to save seeds for,” says Johnston, “which is why they tended to be maintained. And the seeds maintain viability for a long time.” He encourages beginners to save seeds of tomatoes and beans, two of the easiest to save. Founded in 1975, this granddaddy of heirloom suppliers lists 675 varieties in the catalog and maintains 25,000 vegetable varieties as well as facilitating a seed exchange for members who grow heirlooms. Started seven years ago by a 17-year-old, this company lists 1,000 heirloom seeds and publishes The Heirloom Gardener magazine. 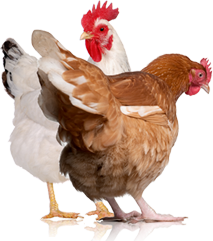 Lists 1,000 heirloom seeds and rare poultry. 100 strains of garlic from all over the world. Tomato, pepper and Italian heirloom seeds as well as live plants. Small family farm selling heirloom potatoes. Includes 84 heirloom varieties as well as hybrids. Offers a variety of open-pollinated, organic heirlooms from around the world. 100 percent organically grown vegetable, flower and herb seeds. Emphasizes heirlooms for the Mid-Atlantic region. Specializes in beans, but carries other vegetables and flowers. Heirlooms, hot peppers and herbs. A nonprofit organization dedicated to preserving and enhancing plants used by Native Americans of the Southwest. Heirloom squash, corn and melons. Provides culinary specialty, certified organic, gourmet and heirloom seed varieties. Princeton, Mass., gardener Kevin Fielding began growing heirloom tomatoes after he met garden photographer David Cavagnaro on the Internet. For many years, Cavagnaro worked at Seed Savers Exchange. He still grows 200 varieties of heirloom tomatoes as well as other old varieties in his own gardens. He taught city-bred Fielding how to start his own seedlings and save the seeds. The experience was a life-changing one for Fielding, who began to reach for his roots by growing “Mr. Charlie,” a red, heavily-ribbed, fluted tomato, and “Chinese” cucumber, a long, curly variety with wonderful flavor. The intriguing names of many heirlooms are enough to hook most gardeners. “Drunken Woman Fringe-headed” lettuce, “Radiator Charlie’s Mortgage Lifter” tomato, “Bull’s Blood” beets and “Cherokee Trail of Tears” beans conjure up interesting images with their colorful descriptions. Having grown 15,000 heirlooms over the years, Cavagnaro points to the advantage of finding locally adapted varieties. Among his favorites are “Tommy Toe,” a 1-inch cherry tomato that has repeatedly won taste tests; “Moon and Stars” watermelon with its irregular yellow spots; colorful, striped Italian eggplant “Listada di Gandia”; “FeherOzon,” a pointed, fleshy, pimento-type pepper from Hungary; and “North Georgia Candy” squash, a smaller, extremely sweet banana type. Garlic guru Joel Girardin of Cannon Falls, Minn., has been growing heirlooms ever since he perused a Seed Savers Exchange catalog 10 years ago. “When I got their fall catalog listing all the seeds and the people that had them, I just sat down and was totally dumbfounded,” he says. Now he and a friend grow 150 varieties of garlic, 200 heirloom tomatoes, 20 different melons, 20 squash and several other vegetable varieties in their one-acre garden. Girardin sells some of the produce at a local farmer’s market and he’s noticed the public is becoming more educated about heirlooms. “When I first started doing this, I would take the different tomato varieties and cut them up so people could see what they look like inside,” he says. Girardin’s favorite heirlooms include “Matt’s Wild Cherry,” a small tomato thatdoesn’t crack very easily; “French Fingerling” and “Viking Purple” potatoes; “Golden Delicious” squash; “Frog Leg” shallots; and “Georgian Crystal” garlic. 1. Squeeze out the jelly-like substance containing the seeds from the cavity of the ripest tomatoes from the best plants. Add ¼ cup water, put in a dish and cover loosely. 2. Ferment for three to four days in a warm place, stirring once a day. 3. Pour off liquefied pulp and floating seeds, retaining the seeds that have sunk to the bottom. 4. Place these seeds in a dish and dry for three to seven days. 5. Label and store in tightly sealed, glass container in a cool place. Heat and moisture are the worst enemies of stored seeds. For a complete seed-saving guide that describes specific techniques for saving the seeds of 160 different vegetables, purchase Seed to Seed, Second edition, by Suzanne Ashworth. This book can be order from Seed Savers Exchange, Decorah, IA. Kirk Bratrud, chef at the Boathouse Restaurant in Superior, Wisc., grew up in a gardening family; he remembers his grandfather keeping a unique strain of pole beans. Although the short growing season in his area limits their availability, Bratrud incorporates heirloom tomatoes into his menus during the summer months. “You tend to have a greater variety of size, shape, color and texture of the flesh for specific uses,” he notes. “What is wonderful is that you can have a bright-green tomato that’s fully ripe, or a black one or a light-colored one, and tomatoes which are very large or quite small.” Bratrud says people growing heirloom tomatoes are very careful about when they pick them so they are usually absolutely, perfectly ripe. He prepares a tureen that encases various tomatoes in a celery root wrapper with layers of eggplant or carrot puree cemented together with aspic. One of his favorite tomatoes is the “Zebra Stripe,” which is bright-green with purple ribbing. “It’s absolutely gorgeous and provides wonderful contrast when you cut it and place it in combination with other colored tomatoes,” he says. Owner and chef, Sean Lewis, recently openedNokomis Restaurant on the North Shore of Lake Superior near Two Harbors, Minn. He has organic produce, including heirloom varieties, shipped in via Fed-Ex from Ohio. Among his favorites are “Green Sausage” and “Siberian Pink” tomatoes; “Pink Wink” potatoes; “Candy Stripe” beets; and “Tongue of Fire” beans. Rhys Williams supplies Anderson with nine varieties of heirloom tomatoes from Featherstone Farm, an organic vegetable farm he runs with partner Jack Hedin. He agrees that shipping tomatoes takes a lot of the life and taste out of them. “Striped German” and “Cherokee Purple” are Featherstone’s most popular tomatoes, and their heirloom tomato season generally lasts 10 to 11 weeks. The farm has 75 acres under production, and they sell to grocery stores, restaurants, farmers markets and wholesale markets in Chicago and the Twin Cities. Preparation: Heat 2 quarts of water in a large pot, bring to boil. Drop beans into water and simmer for 5 to 10 minutes depending on preference of doneness. Drain beans and plunge into a bowl filled with ice water to stop cooking process. Sprinkle with salt, sesame oil and seeds, tossing to coat beans evenly. Williams says heirlooms have been good for the farm, but they are not easy to grow. “Disease is the biggest problem we have,” he says. “They’re very susceptible to blight, and if you’re organic, you’ve got to be on top of it. Applying copper is basically the only thing you can do and you have to be vigilant about applying it when moisture is present. Also, you have to make sure you stake the plants and anchor them well because some of the varieties, like ‘Striped German,’ get quite large.” Williams grows heirloom tomatoes on black plastic with drip irrigation. He spaces them some distance apart in the row and plants them on a windy ridge for good air penetration. Weller agrees that heirlooms can be more difficult to grow, that they are more fragile and that their yields are sometimes lower. To counter their tendency toward disease, she mixes varieties and rotates crops, believing that this makes it harder for pests to find what they are looking for and disease is not spread as rapidly. Weller’s favorite heirlooms include “Hutterite Soup,” a white bean that cooks into a creamy, hearty soup; “Goldmarie Vining,” a flat, yellow bean that stays tender and flavorful even when eight to nine inches long; “Carouby de Maussane,” a very prolific French snow pea with 4- to 5-inch pods; “Cocozelle,” a summer squash that stays firm when cooked and has a subtle, nutty flavor; “Lakota,” an orange and green winter squash with sweet, deep orange flesh; and “Black Plum,” a rare tomato that makes a mahogany-colored sauce. 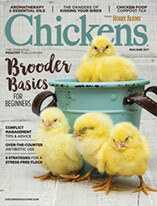 This article first appeared in the May/June 2006 issue of Hobby Farms magazine. 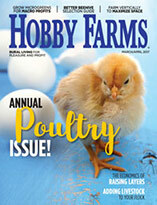 Subscribe to Hobby Farms today!